Could You Pass a Trinity College Exam in 1880? So could you pass a Trinity College exam in 1880? The sheet at the left contains the Annual Examination questions for all Trinity students in 1880. It presents three passages chosen from Suetonius’ Lives of the Caesars followed by essay prompts. 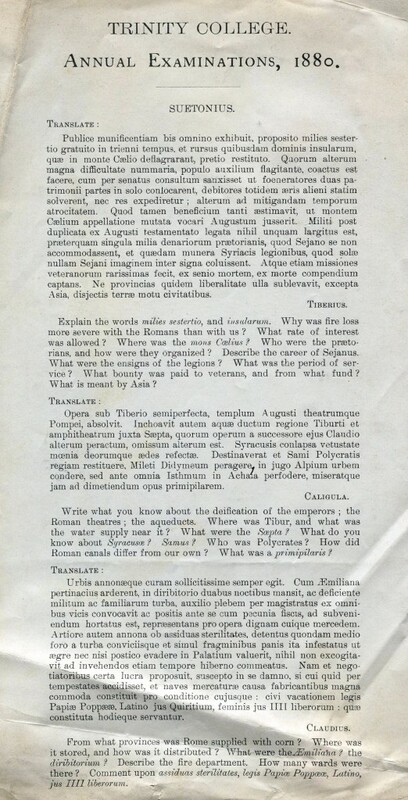 Notice this is not just an exam for Classics students — everyone was expected to be able to render Suetonius’ Latin into English and explain some of the problems raised by the texts. This exam was found in the papers of a Trinity student named Carpenter in a file dated 1882, deposited in the Trinity College Archives. Thanks to Richard Ring, Head Curator and Librarian of the Watkinson Library, who found it while prowling through old files. If anyone knows anything about Carpenter — so far all we have is his name — please let us know. Meanwhile, enjoy testing your 2013 knowledge against a college student of 1880! This entry was posted in Uncategorized on December 12, 2013 by Gary Reger.